HowMechanismWorks ? 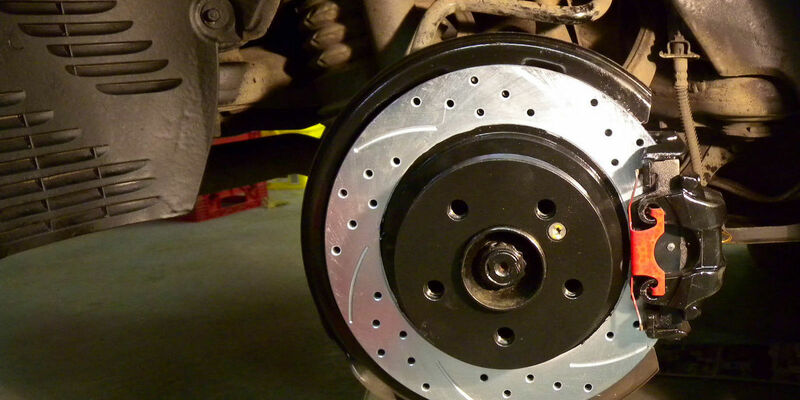 : How Anti-Lock Brakes Works? An anti-lock braking system or anti-skid braking system (ABS) is an automobile safety system that allows the wheels on a motor vehicle to maintain tractive contact with the road surface according to driver inputs while braking, ABS prevents the wheels from locking up, thus avoiding uncontrolled skidding of the vehicle and decreases the distance traveled without slipping.This braking force generate by some means like hydraulic pressure, Air pressure etc. We know that when we apply brake, it pushes the brake pad on running drum or disk.For heavy loaded vehicle we need to high braking force to stop of slow down the vehicle. When the vehicle is running and we want to stop the vehicle we push the brake pedal. Due to excessive braking causes skidding. This skidding jam the wheel but due to inertia the vehicle tends to skid on the road and it became out of control from driver. 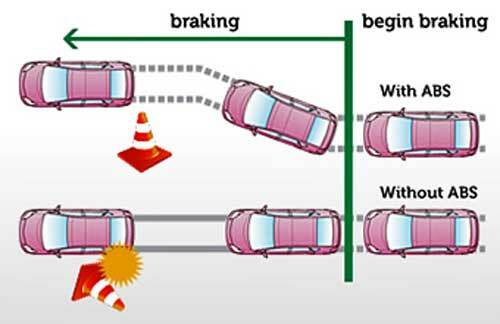 This is called locking of the wheel.Where as in case of ABS system it is an automated system that uses the principles of threshold braking and cadence braking which were practiced by skillful drivers with previous generation braking systems. It does this at a much faster rate and with better control than many drivers could manage. 2.And a means of restoring the pressure to the brake line after release. 3.The third feature is necessary because the anti-lock system has to work without the driver releasing and reapplying pressure on the brake pedal, and without the pedal sinking to the floor. The situation gets particularly tricky during monsoons, as cruising in a car at such high speeds is a perfect recipe for a disaster if the roads are slick. Even so, it does happen, so what do you do in a situation on a slippery road when you have to suddenly apply the brakes of your car? Without an anti-lock brake system, the wheels of your car stop spinning and the car will begin to skid. You’ll completely lose control over the car and the results can be deadly. So the 'ABS' generally offers improved vehicle control and decreases stopping distances on dry and slippery surfaces; however, on loose gravel or snow-covered surfaces, ABS can significantly increase braking distance, although still improving vehicle steering control. This sensor monitors the speed of each wheel and determines the necessary acceleration and deceleration of the wheels. It consists of an exciter (a ring with V-shaped teeth) and a wire coil/magnet assembly, which generates the pulses of electricity as the teeth of the exciter pass in front of it. The valves regulate the air pressure to the brakes during the ABS action. There is a valve in the brake line of each brake that is controlled by the ABS. In the first position, the brake valve is open and it allows the pressure from the master cylinder to be transferred to the brakes. In the second position, the brake valve remains closed and pressure from the master cylinder to the brakes is constrained. In the third position, the valve releases some of the pressure on the brakes. The third step is repeated until the car comes to a halt. The resistance that you feel when braking suddenly at high speeds is actually the brake valves controlling the pressure that is being transferred to the brakes from the master cylinder. The ECU is an electronic control unit that receives, amplifies and filters the sensor signals for calculating the wheel rotational speed and acceleration. The ECU receives a signal from the sensors in the circuit and controls the brake pressure, according to the data that is analyzed by the unit. The Hydraulic Control Unit receives signals from the ECU to apply or release the brakes under the anti-lock conditions. The Hydraulic Control Unit controls the brakes by increasing the hydraulic pressure or bypassing the pedal force to reduce the braking power. Now we have already know that how locking of road wheels due to excessive braking causes skidding. Modern antilock brake systems not only cause the vehicle to stop without deviating from its straight line path, these also provide directional stability since there is no skidding of the wheels. ABS uses wheel speed sensors if a wheel-locking situation is detected or anticipated, trying to lock up during braking. If a wheel tries to lock up, a series of hydraulic valves limit or reduce the braking on that wheel. by releasing the braking pressure just before the wheels lock up, and then reapplying the same. These releasing and reapplying the brakes in succession is what an anti-lock system does and this process is called pressure modulation. This system can modulate the pressure to the brakes about 15 times per second. The feel of brake pedal in case of ABS equipped brakes is quite similar to that of conventional power brake system. An ABS consist of an electronic control unit, one sensor on each wheel, an electrically driven hydraulic pump and a pressure accumulator. Accumulator is used to store hydraulic fluid to maintain high pressure in the braking system and to provide residual pressure for power assisted braking. ECU monitors and controls the antilock function when required. Its function is based on inputs from the wheel speed sensors and feedback from the hydraulic unit to determine whether the ABS is operating precisely and also to decide when the antilock operation is required. In some antilock braking system, a lateral acceleration sensor is also provided to monitor the side movement of the vehicle while taking a turn. This ensures proper braking during turns also. When the front wheels of vehicle are locked, its maneuverability is reduced, whereas in case of rear wheel locking, the vehicle stability is reduced. ABS calculates the required slip rate of the wheels accurately based on the vehicle speed and the speed of the wheels and then controls the brake fluid pressure to achieve the target slip rate. Although ABS prevents complete locking of the wheel.